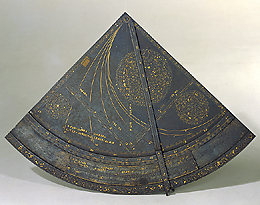 The lines, numbers and different markings are inlaid in gold and silver on this iron quadrant. The pointer is attached at the right angle. A curved cursor bearing the zodiac is inserted on one face. The cursor can be positioned according to the latitude at which one wishes to determine the time, allowing the quadrant to be used in different places. The opposite face bears an astrolabe quadrant, following Oronce Fin?, and another pointer. The maker was the Frenchman Jean Giamin who made the instrument in Rome.